W. Craven was born in Carlisle but grew up in Newcastle, running away to join the army at the tender age of sixteen. He spent the next ten years travelling the world having fun, leaving in 1995 to complete a degree in social work with specialisms in criminology and substance misuse. Thirty-one years after leaving Cumbria, he returned to take up a probation officer position in Whitehaven, eventually working his way up to chief officer grade. 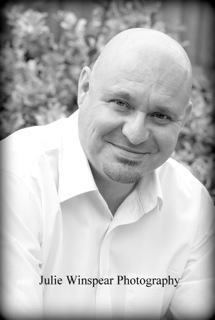 Sixteen years later he took the plunge, accepted redundancy and became a full-time author. He now has entirely different motivations for trying to get inside the minds of criminals . . . The Puppet Show, the first in a two-book deal he signed with the Little, Brown imprint, Constable in 2017, was released to critical acclaim in hardback this year. It has been sold in numerous foreign territories and the production company Studio Lambert, creators of the award-winning Three Girls, have optioned it for TV. The sequel, Black Summer, follows in June 2019. W. Craven is married and lives in Carlisle with his wife, Joanne. When he isn’t out with his springer spaniel, or talking nonsense in the pub, he can be found at punk gigs and writing festivals up and down the country. Peter: It was a pleasure to read your book The Puppet Show and I am delighted that we have the opportunity to conduct this interview. Many thanks for making the time available. Peter: Where did the idea come from in creating The Puppet Show? Mike: The idea had actually been with me for a while, ever since I’d discovered there was a stone circle very close to where I used to live in Cockermouth. I’d looked into it and was fascinated to find out that Cumbria has more stone circles than anywhere else in the UK, and that in Neolithic times, our quiet little county was quite the hub of things. But because I’m a crime writer, not a historian, I thought it would be rude if I didn’t start killing people in them. Peter: You have created several major characters in this novel. Who was your favourite and who was the most challenging to develop, and why? Mike: Tilly is my favourite character, both as a (fictional) person but also to put words in her mouth. I’m constantly on the lookout for things she might say, things she might find interesting (even when no one else does) but also how I can develop her as a character without losing that essential ‘Tilly-ness’ that readers love. The most challenging is Poe. There’s a fine line getting it right with him. Go too dark and it becomes implausible, don’t go dark enough and he becomes less interesting. Luckily I have an editor and a line editor who know the characters just as well as I do, so if I get things slighlty wrong they can help steer me back. Peter: Your Washington Poe and Tilly Bradshaw characters are wonderfully drawn and look set to become a strong partnership. What appeals to you about their individual traits and their interaction with each other? Mike: The ‘odd couple’ technique is tried and tested, and even though that’s not what I set out to do (initially Poe wasn’t as dark and Tilly was a bit more streetwise), their pairing works well. The feedback I get is that Tilly steals all the scenes she’s in but without Poe, I don’t think they’d work. Their characteristics, if you only look on the surface, can appear very different: Poe’s a tough, no-nonsense misanthrope and Tilly’s a naive and rather sweet academic. But if you go under that you’ll see that they do have traits in common – they’re both dogged when it comes to seeking the truth (they obviously go about it in different ways and play to their own strengths), they’re very loyal to each other and they can be equally as stubborn and reckless. Together they are formidable. Peter: Do you feel your background in the army and as a probation officer helped in writing this novel? If so how? Mike: My army days installed in me a dark sense of humour – there isn’t much I can’t see the funny side of – and my probation days gave me a thorough grounding in police procedures. How cops speak, how they use technology, how the police actually work as a large and sometimes unwieldy organisation. It also gave me loads of contacts I can call on if there’s something I don’t know. Peter: How important do you feel it is to research elements that you integrate into your story, such as character traits, police procedures and location? What was interesting to discover in your research for this novel? 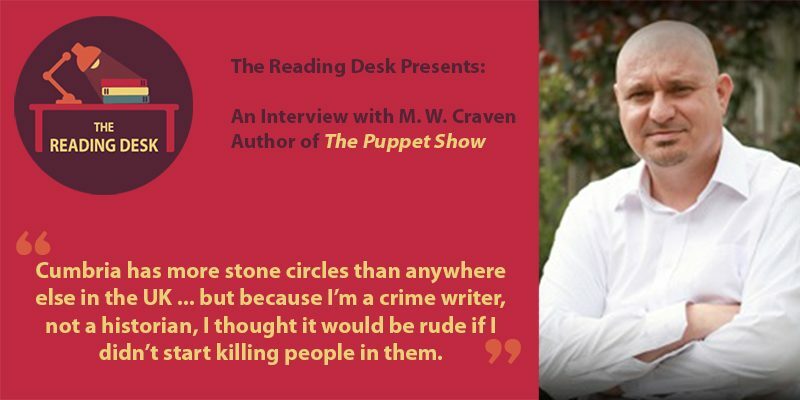 Mike: I think readers of crime fiction, especially crime fiction readers in the UK, expect a certain level of authenticity and know when they aren’t getting it. They don’t expect you to discuss every facet of a murder investigation as it would be too unwieldy, but they are intelligent and well-informed, and they know when you’re getting things wrong or simply winging it. Therefore if I mention a police technique – the automatic number plate recognition system I use in The Puppet Show is an excellent example – then I firmly believe that you should get it right. I’d already been to the locations mentioned in the book so it was pre-researched as it were. Mike: As an ex-probation officer I always want to know why someone commits an offence and to that end, I always start with the crime and have a good idea about why it happened. I then drop Poe into the investigation and ask him to solve it. I don’t use storyboarding or mapping but do have notes that are roughly arranged in the right order. Mike: I am disciplined. I get up and walk the dog, get back and have breakfast and a shower. I aim to write for the rest of the day, which usually works out as 10am to 1pm, 2pm to 6pm day, Mon-Fri. I tend to do admin and social media first thing in the morning and last thing in the evening. Of course sometimes my editor or agent will need something so I remain as flexible as I can. I get the bulk of the first draft of a novel done between 1st December (the day I start each year) and May the following year (when the festival season begins). I work on revisions as and when I can as the edits for the previous book start coming back around then. I aim to submit the new book to my agent late summer, early autumn, which is well within my 1st Jan deadline. Mike: No. I use Word for Mac. Never let me down. Mike: The freedom to do what I love. I’ve been lucky enough to write full time since 2015. Restrictions? None that spring to mind – I still enjoy every day, still enjoy meeting readers and still get a buzz when I think of something funny for Tilly or something nasty for Poe . . .
Peter: How involved are you in finalising other aspects of the book, for example, the cover design, narration and the promotion of the book? Mike: I get consulted on everything and my opinion is taken into account, but when it comes to the big publishing houses it’s sales and marketing (the ones who have to put it into the hands of the reader) who have the final say. I came up with the idea for burning letters for The Puppet Show but the cover designer, a great guy called Sean, exceeded even my wildest expectations. For Black Summer, the sequel to The Puppet Show, all I did was sit down with Sean and discuss the themes in the book. He designed eight versions from scratch and together we all chipped and took the best bits from them and came up with the final cover, which will be revealed next month. I was asked to listen to the narrator and to give my approval, which I was happy to do. Mike: Little, Brown have hugely experienced publicists and marketing professionals and they get a bit nervous when their authors try and do too much. I tend to leave the bigger bits up to them and focus on Twitter, my Facebook page and my (new) newsletter. Mike: Mick Herron and Terry Pratchett are the two UK based authors I admire most and who have had an influence on my writing. In the United States it would be Michael Connely and Carl Hiaasen. Terry, Mick and Carl are superb writers but they’re also extremely funny and Michael is, in my opinion, the greatest living crime writer. Mike: You Don’t Know Me by Imran Mahmood blew me away. I’ve also read two books that aren’t yet out – The Devil Aspect by Craig Russell and To The Lions by Holly Watt – which are deservedly going to be huge. Mike: That’s easy: get out and meet people. Approach authors and speak to agents and publishers at events and festivals. Every big thing that’s happened in my career has been because I’d previously met and engaged with the person before I submitted anything to them. Mike: The second Poe book, Black Summer, is out in June. We’ll be revealing the cover soon and my publisher is very excited about it as they feel it is the stronger book. I can’t say too much about Poe 3 & 4 as the announcement hasn’t yet been made (it might have been by the time this goes out) but Poe 3 is called The Curator and Poe 4 is untitled. I’m currently writing 4 and plotting 5 (The Chemist) and 6 (The Dead Letter). Mike: Follow me on Twitter (@MWCravenUK), sign up to my Facebook page and sign up to my newsletter via my website (mwcraven.com). I try and keep everything out in the open. There may even be news on the TV adaption soon . . .
Peter: I appreciate you taking the time for this interview. If there are other snippets of information you wish to provide, please feel free. I would like to congratulate you on your wonderful books and I wish you massive success for the future.